The MusicWorx Toolbox course Group Music Therapy Interventions Strategies and Techniques for Relaxation and Creative Arts Experiences discusses the prescribed clinical use of music in order to stimulate positive changes through informational approaches of intentional listening, relaxation, creative arts and much more. These materials have been field tested in a variety of settings, including substance abuse and eating disorders. This course is all about creativity and includes lists of necessary supplies and resources in order to provide a template for therapists to adapt for use in their respective settings. References to items on the Board Certification Domains are based on the Practice Analysis Study of 2014. 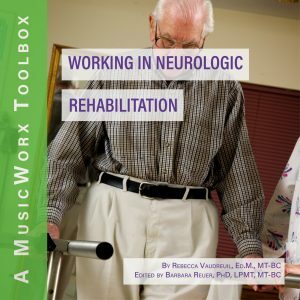 Those registered for the MusicWorx Toolbox course Group Music Therapy Interventions Strategies and Techniques for Relaxation and Creative Arts Experiences will develop or improve their abilities to use music therapeutically in a variety of medical settings, including inpatient facilities, outpatient facilities, and at the bedside. Select five musical pieces appropriate for an individual's active / intentional relaxation at home. Describe three benefits that creative arts and music can provide a patient with relaxation goals. Explain what a mandala is and the purpose for incorporating creative arts into music therapy. Describe four different methods of relaxation techniques clients can use at home individually. 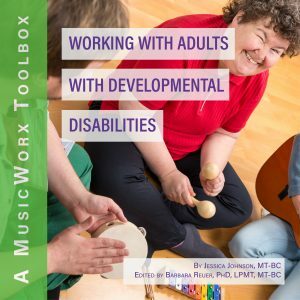 Dr. Reuer is the founder and CEO of MusicWorx Inc., an international clinical training program for music therapy interns as well as provider of workshops and seminars covering wellness, community-building, and stress management, for healthcare professionals, educators, and corporate clients. Dr. Reuer’s vast experience includes more than 40 years of clinical practice in public schools, older-adult facilities, hospices, medical and psychiatric hospitals, corrections facilities, substance abuse and eating disorders programs, and health spas and course instruction at the community college and university level. Dr. Reuer has served as President of the National Association for Music Therapy (NAMT). She was the year 2000 recipient of the Professional Practice Award from the American Music Therapy Association (AMTA) for significant contribution to the practice of music therapy. And in 2008, Dr. Reuer received a Lifetime Achievement Award from AMTA. Dr. Reuer has authored and co-authored several books and articles. Print media feature articles and numerous prestigious publications frequently quote her. She has appeared in several televised interview formats at local, national, and international levels, including the Lifetime Network television series New Attitudes. "I enjoyed it and got lots of great ideas. Thank you"
The use of creative arts in the session and the integrative approach [were most useful to my practice]. There were new ideas I would like to try for my clients (and myself sometime). I thought this course was excellent. Overall, the whole thing, but in particular I did find the creative arts session ideas very helpful. I have not used some of them before, and have not heard of some of them as well so it broadened my idea bank. This course was very helpful in expanding my skillset. My patients all need help with learning relaxation techniques ... Thank you! The packet for Group Music Therapy Interventions: Strategies and Techniques for Relaxation and Creative Arts Experiences was well put together and will be a great addition of resource material in the Music Therapy Room. Thank you again. I really do enjoy taking your courses. Such a great wealth of information. Very quick turn around in receiving back the certificates as well. I really appreciate it! 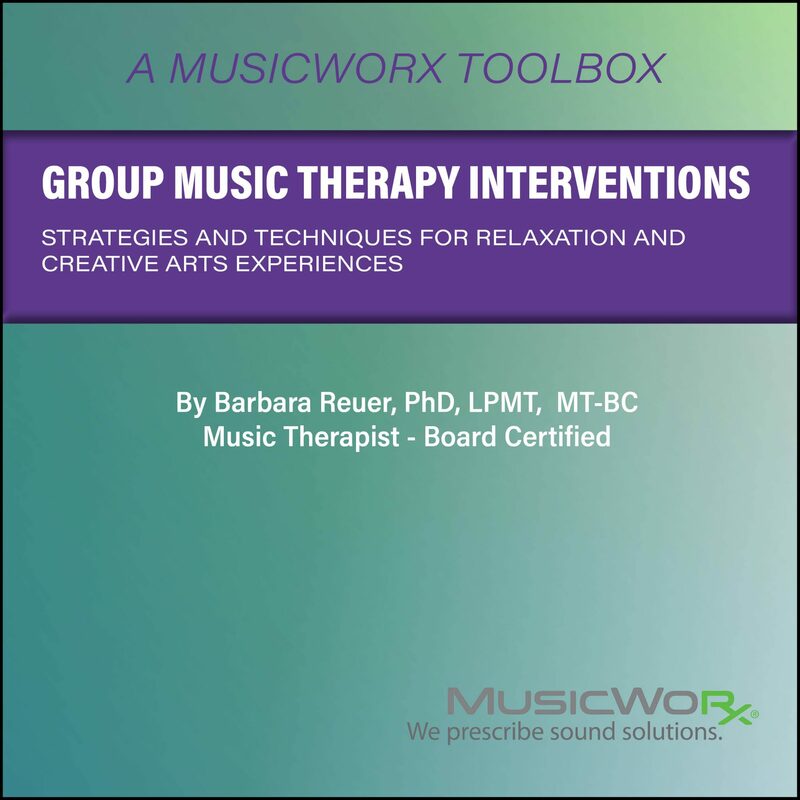 I ordered and received MusicWorx Toolbox title Group Music Therapy Interventions Strategies and Techniques for Relaxation and Creative Arts Experiences. I am finding it to be an excellent resource. Thank you for making this available for CMTE credit! Thanks very much for getting the certificates back to me so quickly! I appreciate it. Now I'm ready to re-certify—what a relief! I'm sure you know how expensive almost all of the other courses are out there—whether home study or not. The affordability of your courses are a huge blessing to people like me! Yours are fun to take. So hopefully you will make a few more before I begin thinking about re-certification again. Thank you so much! It was a superb course for me . . . the training, the materials, the cost, the assignments, and being able to do it in my timing at a distance is the greatest blessing. This course has broadened and deepened my knowledge of age-appropriate musical selections. It was a pleasure to complete the assignments, and I look forward to taking another course form MusicWorx. Thank you.